Click the image to download a .pdf of the dewormer chemical classes chart. Many veterinarians advise rotating different deworming “chemical classes” during different times of the year. There are three classes of dewormers available today: macrocyclic lactone, pyrimidine and benzimidazole. All of these contain several drugs within them. Additionally, there is a drug called praziquantel that doesn’t fall into any of the above classes. It was introduced a few years ago to treat tapeworms and is typically combined with a drug from the macrocyclic lactone class. Your veterinarian can advise you on which chemical classes and which drugs to use, and when to use them. Remember that different product names don’t necessarily mean different chemicals. There are many products that contain the same active ingredients. 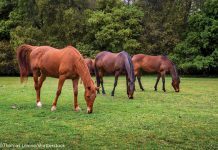 If your veterinarian recommends rotating between the different classes, it’s important that you follow the program to ensure the best protection against parasites for your horse. The downloadable chart provides a breakdown of the many equine dewormers on the market today. Each product is broken down by chemical class, drug (active ingredient) and manufacturer. Keep this chart handy when talking to your veterinarian about your horse’s deworming program. 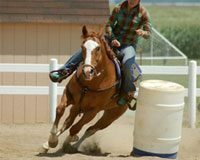 Print out a chart to keep track of your horse’s deworming schedule. Back to New Thinking on Deworming. helpful article, printed off the chart to help me remember which one to buy. I refer to this chart quite often. Great to have it and good article! !